Eyeshadow Pan by Makeup geek! At last I get my hand on these after a few influence by my friends and of course the ever beautiful Jaclyn Hill. She is just an amazing YouTuber that has such an amazing talent. Makeup geek eyeshadow has been in the market for quite sometime but I don't know why I am not interested in it until now. After years of collecting makeup and experimenting on things, I decided to collect single eyeshadow. I started with MAC eyeshadow actually. But then I realize the quality of the shadow is good but just overpriced and just have to stop supporting them for personal reasons. (Don't argue with me on this). I really want an eyeshadow single of my favorite shades. So after a few search and goggling done, I decided on these two shades that is Shimma Shimma & Creme Brule. I pay using PayPal and it takes 3 weeks to arrive. Pretty long. But the shipping charge are not that expensive. The eyeshadow comes in a flat paper packaging that really look like the MAC ones. The names are stated on the back of the eyeshadow pan. The size are also the same as the Mac Eyeshadow pan. The different between them are that Mac comes with a magnet attach on the back of the eyeshadow pan but Makeup Geek does not. So if you want to store it in the 4 empty refills of the Mac so you need to buy a magnet sheet or something. I am not sure about Z Palette, I think the Z palette it self are a magnet. I wanted to find a cheap option for the Stila Kitten. The Stila Kitten is RM69 each. Pretty a splurge for me. Some said the Shimma Shimma are a dupe for it. I fell in love with the Stila Kitten after swatching Sabby Prue eyeshadow pallet that she got. It is just an amazing gorgeous color that I think can be wear for everyday and its creamy and just so beautiful. Shimma Shimma to me is pretty similar to Stilla Kitten, its creamy and pigmented as the Stila Kitten but I find that Stilla Kitten has a more warm undertone to it. The Shimma Shimma is more to a cool tone but still it is super gorgeous. I love to use it on my lid and just match it with another neautral matte eyeshadow to warm it up. The second shade I got is Creme Brule. Describe as a soft medium sand color has a velvety matte finish. I bought this because I want a warm undertone, transaction color for my everyday use. I usually use Cork by Mac but its too deep and too brown. I saw the swatches online that this has a bit of an red-orange tone to it which I find nice. Glad I bought it! I super love this color, its amazingly pretty on my eye and brig that nice hint or warm on my outer lid. Its matte, its creamy, its not chalky and just so pretty ti be blend with any color. I use the Shimma Shimma all over my lid and give a depth effect by contouring my outer lid using the Creme Brule. These eyeshadow stay all day especially when you use a primer underneath. Overall I could say that Makeup Geek Eyeshadow are worth buying. Especially for you who are starting to build your own eye-shadow pan or simply want a palette for your make-up service collection. The price is half of Mac and other high end brand but the quality is just mind blowing. If you don't know how to shop just go to these shop that is based in Malaysia. They do pre-orders and they can help you buy them, The Fashionette , Makeup_Crime , Buff vanity. Since I was a kid, I was raised by my grandmother. I live somewhere that most Johorean know. It is a place where people mourn and dress in black. Yes, my grandma house is just beside the Muslim cemetery. It is one of the most famous cemeteries in Johor and where most car accident happen there... Everyday coming back to school, I will need to walk inside the graveyard in order to get shortcuts. Glad I have not yet met "anything" in particular... yet? Admit that I love ghost stories and then I find hard to sleep afterwards. haha. One of the experience I had when I was a kid living near the Muslim cemetery are of course during the night when I have to walk alone going back from my Quran class. I always had that feeling of something following me. eek! And one of the experiences I can't forget that happen to me is during that night. I heard something howling. It does not really sound like an ordinary dog. It's more like a wolf! Or I could say something big! Just beside my window. My window is near to the cemetery. There were loud scratches and loud stomp sound just like waiting to come in through that window. Eeek again! More stories? I could not even want to remember! But then again, when we talk about ghost stories why it has to be a frighten one. Who said ghost can't have love? Cornetto brings joy in anyone. I mean anything in this world! As you bite in those crunchy nuts, that oh so creamy ice cream and don't forget the last bite of that sweet crispy cone! I always fight for that! It's what they said save the best for the last! Cornetto also believes that how this sweet snacking time could bring joy to anyone as well as connects the love and affection to each one another. Now what's up with the Cornetto Hikayat Po and Lang? Who is Po? What is Po? What Cornetto has to do with these ghost stories? Joy? Love? Watch below teaser! Here a little spoiler for you. Not really a spoiler lah. hehe. There is this creature called Lang. Better known as Langsuir. You know what is Langsuir? It is some kind of a creature that said to appear in white and long black hair and loveeee to eat Cornetto ice cream. Nah I'm just kidding. Or am I? So when Lang has lost her ability to scream and ya know the thing that they do. Cackled! She finds that there is something missing in her heart. Something is not right. Something that's need to be filled. So she decided to go somewhere where she can find this empty space to be filled. So she went off and meets a boy. The boy was eating Cornetto and the boy says that he is happy. Lang began to realize that it is joy that she have lost. So there is where Lang was bought to Kampung Cempuaka. There is where Lang meets Po and the other creatures. There is when, the drama starts. The other creatures could not hear her voice except for there is this one creature. Watch the web series! The 1st episode starts today! Who is it? Love story? Jealousy? You see for yourself! OMG. When is the last time I did my Wishlist Wednesday! 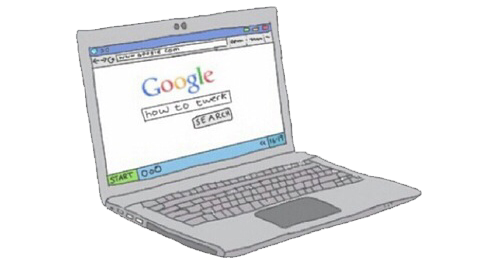 Talk about how busy I am not to have time scrolling over people blog that much. :( But then I have just finish my study and now I am working. I have more time to really enjoy reading and discovering new brands and products my friend suggested me. Now blame Sabby, Wiida, Newrulefarah and Jannah. They have much influence me into this Too Faced craze. I actually have vow on not buying anymore eyeshadow palettes. I am already starting to collecting single eyeshadow pan to build my own palette. But But.. 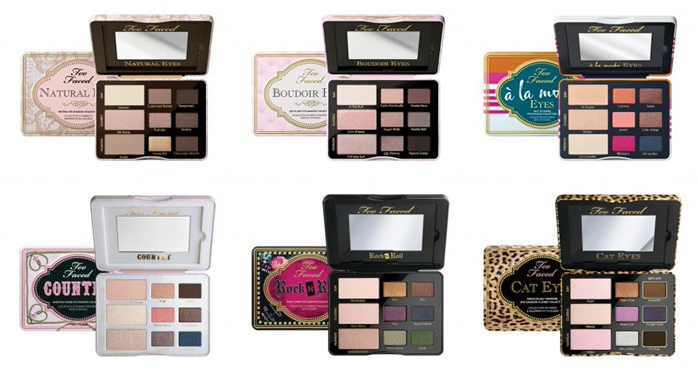 These palettes from TooFaced are just too cute, I can't resist! Too Faced is actually a company founded by 2 guys. Yep guys! They have this cute yet modern vinatge type of design to all of their products. So I browse through TooFaced official web store (not available international shipping tho), just browsing. And I discover their variety of metal tins palette. From what I can remember is the cardboard type eyeshadow palette. Where we I all this long! There are so cuteee! I want them all! But I am not sure if we have all of the palettes here in Sephora Malaysia. It retails around RM120.00 each if I am not mistaken. Are they just too gorgeous! Too Faced eyeshadow are also know to its highly pigmented and quality shadows. I sold by my own words! Other than that I also have been eyeing on some of the other products they carry.As I said, I am obsessed with cute makeup packaging! I really want their Sweetheart Blushers. Just need! 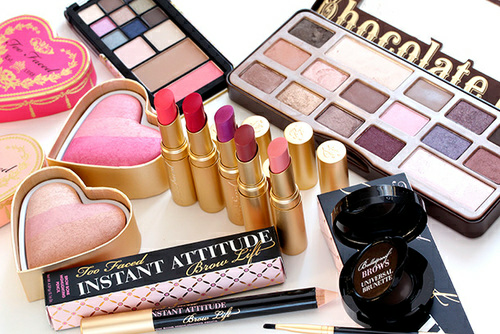 *Pictures credit to Makeupandbeautyblog and TooFaced webstore. I usually post up my monthly favorites on the 1st on each month. But I just got so busy again and again. Life can be too complicated sometimes. Haha. So for the last July I discover new skincare favorites. I have been obsessed on taking care of my skin. After watching a few YouTube videos realizing that how important it is to exfoliate, these products comes in and I have been obsessed with it ever since. Hands down. One of THE best cleanser I ever use although I don't really love the scent of it. For me most cleanser does the same job. It cleanse. I mostly can't tell any different of the cleanser I use, only if it cause me too much drying or irritation. But this cleanser has been so awesome I can dance! Ok I'm just kidding. This cleanser has been doing so good to my skin. Its hydrating and it leaves my skin super soft. I also have been using this with the Olay Cleanser tool that is also have been my favorite for the past month. Full review here (link). My first CC cream experience isn't goes so well, but then I get to try this CC Cream and it is amazing. I love this CC Cream. CC Cream stands for color correcting. It is just like BB Cream but this has more color correcting properties. I have been using this all the time during the past month. I love how it gives me this natural fair effect look. It covers pretty well too. Full review here (link). Another skincare product that I have been loving for the past month is this moisturizer. I tried the cream and gel and I have found that the gel works best on me. Its hydrating and keeps my skin healthier. It is not sticky and just feels so good on to my skin. Full review here (link). I am not sure about the real name. Haha. I bought this at Jusco. You know Jusco always have this "Japanese" beauty section contains all sort of Asian style beauty tool. I saw my mom got this from Body shop and she said its awesome. So I bought this as a cheaper dupe from The Body Shop ones. This only cost me RM2.50. I have this "unsatisfied" feeling whenever I took my bath especially during these humid hot days. This helps to give that really clean feeling. Its not that rough but slightly rough than a loofah. It helps ex foliate my skin as well as my underarms by help removing those deodorant that I applied before during the day. Really convenient! Eating is like the best thing to do. I think everyone can agree with me on this. Wowzaa. I personally love dining in and trying out new food. But still I will tend to stick to what I like. I love anything grilled and spicy. Last week me and Mr. T celebrate our 8th year of that special friendship. We have been dating for 8 years. I could not believe it myself. We both love food and I have been wanting to blog about places I ate for so long but for the past year as a student I did not really get to eat at fancy restaurant because of my financial status. So this year we both may have been better, we both just got our own job and alhamdulilah there is always rezeki coming. I don't know if you are interested but I have been wanting to blog more about what I am doing in my life like where did I had some special dinner out, or where I go, rather than always posting product review. So I hope you enjoy. Haha. Keeping skin looking good is a very important issue every woman should take care. L'Oreal has launch a skincare product that claim to be the all in 10 benefit you need for your everyday skincare routine. It is called the L'Oreal White Perfect Total 10. From the popular skincare line called the White Perfect from L'Oreal, they have add another innovative moisturiser that is suggested to be used during your morning skincare routine. Another product is an essence that can be work as a sunscreen/sunblock. L'Oreal White Perfect Total 10 It comes in a unique firm pump bottle. The texture of this moisturiser is just like a light cream. It has a purple tint to it that can help reduce skin looking dull. It's also have a pleasant scent to it. Very refreshing. It's also easy to blend in without leaving any white cast like the usual L'Oreal Day cream have. This pasteurizer has 10 benefits in it, 5 benefits of protecting (anti pollutant uva and uvb rays, oxydation, oiliness effect.) Another 5 benefits are (instant glow probably from the purple tint it has, fairer skin, even out skin tone, anti dark spot probably from the ingredient it has that is Vitamin E,B3 & C that helps fight melanin, anti shine). Overall this is a good cream and will be a good option for you if you are looking for a light and non greasy day cream that also have sun protection in it. It give you this nice fair glow effect to your face and it is light. Perfect for makeup base. L’Oreal Paris UV Perfect Aqua Essence UV Protector SPF 30+++ L'Oreal has a variety of sun screen essence. The first one that I have purchase years ago is the one that comes in a White packaging just like this. Its for matte effect. So the new relaunch Aqua Essence from L'Oreal claims that this is a water base sunscreen. Unfortunately it is not like what I have expected. Water based sunscreen that I have tried before gives me an impression of a very light sunscreen that feels like water. But this one is not really a water based. It feels like the ordinary sunscreen with that ordinary scent. But still, it is quite light and a bit non greasy and white cast effect compare to the other ordinary sunscreen I have tried. Overall it is a pretty good sunscreen, quite hydrating and love the sleek packaging that I find travel friendly. You buy this at major local pharmacies. Maybelline is known for its awesome eye makeup products. Mostly known for its mascara. Today I will show you two eye makeup product from Maybelline. I think both a relaunch and reformulated. The Kajal liner is a re formulated eye-liner from the previous 6 hour Kajal liner. The Hypercosmo eyeshadow is a product that claims to be a highly pigmented, with a unique 3D effect and stunning metallic finish and captivating the summer look with metallic. So here are my thoughts. Maybelline Colosal Kajal 12H Black It said that this is the new and improve Colossal Kajal Eyeliner. The one before clams to last 6 hours but this claims to last 12 hours. Comes in a bright yellow packaging and it is an auto twist type of eyeliner that does not need sharpening. It has a very creamy and precise texture. The tip is pretty firm and fine which makes applying easier. It is super pigmented and waterproof. I had a rough time removing this. It does not smudge but it stains your hand if you rub it. Lasting power was okay. It last me about 3-4 hours. I don't like to use this on my upper lid, but I like to use it on the half of my lower lid. Price wise are also affordable. Hypercosmo Trio Eyeshadow Maybelline has come out with these mineralize baked eyeshadow that offers you metallic eyeshadow finish look. It is not a quad but as you can see it has different colours in it that you can play around. There are 4 shades you can choose from that is Coppered Mars, Venus Gold, Pinky Comet and Galactic Purple. The one I got here are Coppered Mars & Galatic Purple. It comes in a dome shaped plastic packaging that is pretty nice. Pigmentation wise, does not really impress me. The texture is not chalky, but colour pay off is a bit weak. You need 4-5 layers to make the colour really pop off. This is recommend t you if you fond over a very light finish of eyeshadow. This may need a help of a good eyelid base or eye primer to make it last long and look more vibrant. As-salamu alaykum and hello everyone ♡. Many bloggers has review it and I might as well pour my own thought about it! Receive this a few weeks ago and had tested it about a week. This compact powder is said to be a powder that has a unique Clean Touch Powder System. The innovative system helps to absorb sebum and also helps your sweat to dry faster so your skin feels fresh all day long. The Clean Touch Powder System's Mineral Perlite contains 5x more absorption more than normal powder talc. 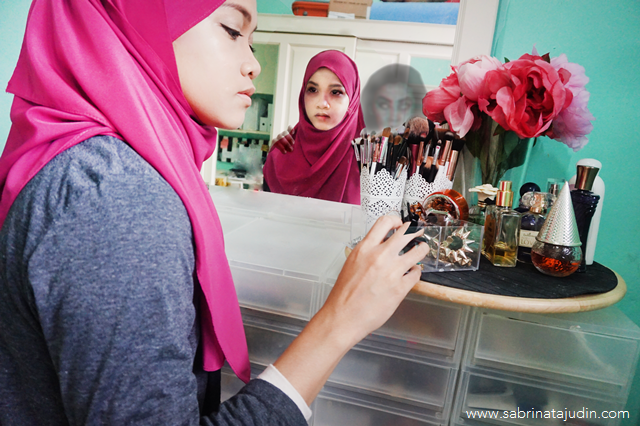 It has a lightweight formula that is suitable for everyday wear. What I like about it. I love the design of the compact powder. Although the white case catches dirt easily, this looks sleek in my collection. It also comes with a nice soft sponge. The texture of this powder is really fine and does not have too much coverage which I like. It is nice to be use above foundation to set it in. It's also have a nice fresh scent in it! Price wise are also affordable. Have UV protection. What I don't like about it. Re touching is needed. It does not last that long on your face. A bit white cast effect if you apply to much. Overall & Recommendation. This is a nice compact powder to have in the stash if you are interested. It has a nice light coverage and perfect for people who are looking for a nice natural makeup items. This is pretty much a basic powder anyone can have. This does reduce shine and leave your skin matte without having a cakey face if you reapply for touch ups. As-salamu alaykum and hello everyone ♡. Today quick review would be a product that I might say I can't live without especially because it is just so important to also taking care of your V area! So if you area guy and you area reading this. Stop here, you have no business here I have tried so many brand of female hygiene wash and it is just for the sake of not using a high PH soap base cleanser under there that might as well as makes me feel just the same. If you know what I mean. Its like just because it says its for your V area and you bought it because it said so and you just use it because you can't use body wash on that area. But this new discovery that I have been using for months now have change my perception. It really makes a different and I am going to let you know my thought on it below! From my own experience it does helps firm up my skin under there, lighten my skin, give me long lasting cooling sensation (it really does! ), hydrate and does not leave my under area dry that ,may cause itchiness (ya know what i meannnn). I am not sure about speeds up wound healing and enhance intimacy because I am not yet married and have kids! haha! The scnt is not overpowering too! Does not have weird herb scent. This also helps eliminates that euw euw smell when you area having your period amd it also help eliminate my "white" problem. What I don't like about it. Maybe I just don't like the packaging. Haha! It looks too simple and I hope it has better packaging because the product it self is so good! This one is in a pump size bottle, they also have smaller bottle of you are interested. The big size pump bottle does not bothers me actually, I love the pump is just that i don't like the design. Overall & Recommendation. Recommend to all ladies put there! But if you don't like cooling sensation feeling down there this might not for you. For me I love it because it makes my V area feel fresh and hydrated! As-salamu alaykum and hello everyone ♡. Happy sunday! I have an eyeliner that has been around blogs and reviews. So I have to also jump in and let you know my thoughts. I can't remember if this eyeliner were newly launch or re-launch because I think I saw it somewhere before or maybe the packaging is the same, I don't know. Maybe I was just making things up. So these Hypersharp eyeliner from Maybelline comes in 3 different colors to choose from. Intense Black, Soft Black and Brown. I got the Intense Black for PR purposes and the Soft Black as a gift so I just thought that I review both. I don't have the brown one here. This eyeliner features its sharp and precises marker tip. This is more like a marker with a liquid texture in it. I have tried gel, pencil, liquid and by far my favorite is still this type of marker and if you know me my all time favorite eyeliner is the Dolly Wink which you can read the review (here). What I like about it. I love how sharp and precise the tip is. The marker it self is very pigmented (for the Intense Black) and drawing wing eyeliner never been easier. It really just reminds me of my favorite eyeliner, that is the Dollywink which could be a cheaper alternative with that. Its also stay pretty long on my lid and fades a bit after a few hours if you sweat a bit and does not smudge and give you that Taylor Momsen look. Price are also affordable. What I don't like about it. I really don't like the one in Soft Black. i just don't understand what is the purpose of I am just too lazy to discover it purpose. It is just too soft and watery. As you can see in the picture above it settle in my fine line and smudge out. I don't see this could be done with anything. Overall & Recommendation. I have use this for 2 weeks now and it is still pigmented (for the intense black). I am not sure how long it will last but so far it is still good. The Dollywink is still pigmented and wet even tho I have been using it everyday since this early year. Overall I really recommend this eyeliner, it is great for beginners especially if you want that soft fine eyeliner look. This is the tool you need. Where To Buy : All participating pharmacies that carries Maybelline products. As-salamu alaykum and hello everyone ♡. Have you heard about Cosmoderm? I bet you must! It is one of the best home grown brand in Malaysia. Their product is affordable and effective. I have tried some of the products and today I will review this make-up remover. It is one of their best sellers. This makeup remover is said to gently and effortlessly removes waterproof make-up at the same time helps retain skin’s natural moisture and keeps skin soft but also recommend to rinse off with water after use. What I like about it. It is very gentle on the skin and my skin does not feel oily or too dry. It does not really swipe off my skin moisture and makes me feel like cleansing are going to make my skin even try. It removes light makeup effortlessly and I love the fresh scent. It is affordable too! What I don't like about it. Well, it does not really help remove waterproof makeup pretty well. You kinda need to really swipe hard to remove those high pigmented makeups. Overall & Recommendation. Recommend this to anyone who wear light makeup or looking for a makeup remover mainly for the skin. I love to use this to remove my face makeup/foundation. It is really moisturizing and keep your skin hydrated. Plus, it has Vitamin E in it! So if you are suffering for acne or skin problems, this is perfect for you. Especially when you have acne, avoid using oil base makeup remover.